Just a few days prior to me and my wife taking our five daughters to the new Gilbert, Arizona temple, I sat for lunch with an LDS Stake President who had taken one of his friends to the temple who was also Roman Catholic. At the end of the visit, this Stake President was taken aback when his friend explained that he expected the temple to be more beautiful on the inside than it was. Statements like this can be a bit disorienting for Mormons since they have been taught from childhood that the temple is the most beautiful place on earth. Here’s my attempt to make sense of this perplexity. You can learn a lot about a religion by how they create their most sacred of spaces. Sacred space provides meaning within a world of chaos, and sacred space is where the essence of the religion comes into sharpest focus. The Hajj pilgrimage for example teaches participating Muslims that their own individual story (regardless of race, gender, wealth, social status, etc) is directly intertwined with the prophets and messengers of old, and as such, this sacred space allows Muslims to attach their narratives to those of the larger Islamic community. Experiencing the sacred doesn’t just enable spiritual transformation, but it tells you what that transformation is to look like. We could observe this with any religion we wanted to look at: Krishna devotees and the Braj pilgrimage, Sufis and their shrines, Buddhists and pagodas, and Catholics and their Cathedrals. 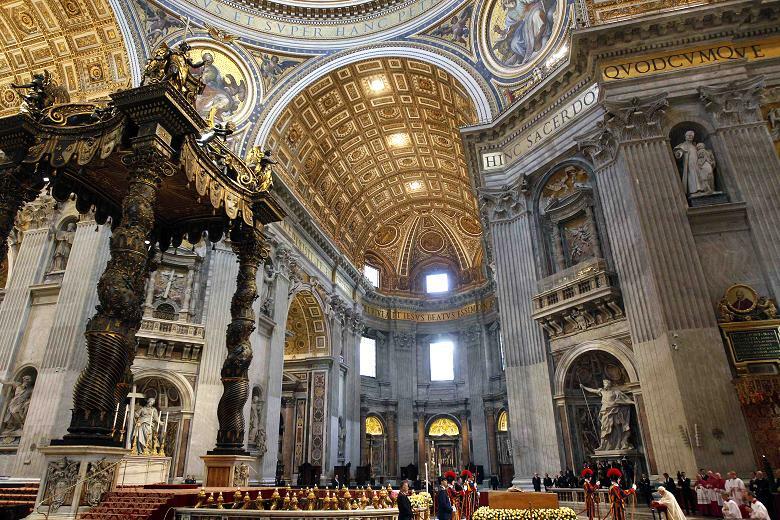 For Catholics, Cathedrals are places of deep reverence for the sacred, but also a place for congregants to participate in and experience this sacred power. Sacred relics with their own powers can be stored at these sites and the altars themselves are sometimes built atop the bones of ancient martyrs, becoming an appropriate setting for the miracle of Eucharist, where the sacred and the divine collide. 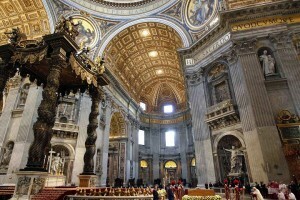 The architecture of the buildings represent humanity’s best attempt to articulate the sacred and provide it visibility. Cathedrals are to be the most beautiful places on earth, and since the context was Europe, this beauty has been associated with kingdom and Jesus as King. It is awe-inspiring and beautiful. Mormons hold their temples as the center place of what they deem sacred, yet there is no sense of kingdom or king when you walk in the doors, but rather that of corporation and family. The entrance room felt like I had entered a very well-to-do law office or the headquarters of a major and powerful corporation. As one would expect in such a setting, there are chairs for temple workers who check to see if you have the credentials to enter. During this open period however, all are welcome. Later on, you will need a “recommend” to enter, meaning you have proven your dedication and commitment to the institution itself, in which two ecclesiastical leaders will approve and sign after private interviews. Once I entered the building, we were guided to various rooms, the lowest being the baptism font, where Mormons perform vicarious work for those who died without becoming Mormon. After climbing many stairs, we enter the top part of the sacred edifice and entered perhaps its pinnacle of sacred space – the “sealing room” where couples are married and families are bound “for time and eternity.” While in this room, those guiding us through had me and my children stand in front of a larger mirror and look in. Because there was another mirror just behind us, our family symbolically embraced infinity. This is the essence of Mormonism. The rest of this Mormon sacred space made more sense with this in mind. 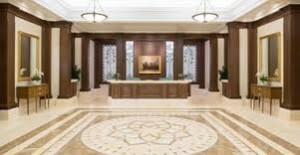 Another important room, the Mormon “Holy of Holies,” or “Celestial Room” represents a place where Mormons directly commune with God. 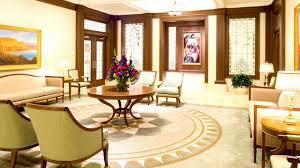 By the time Mormons enter this room, they have been prepared and symbolically transformed into the divine. They make up part of its “living room.” This is consistent with most the rest of the temple interior which looks like the home of a person of extreme wealth – one that welcomes you as part of it. Lining the walls are religious paintings that add to the aesthetic of a comfortable place to dwell, and nothing there serves to make distinctions between what is worshipped and those who worship. It is not the pictures in the halls or the huge chandelier in this special celestial room, but rather the presence of the people who visit the “house of the Lord.” Their presence is what makes it sacred. They are transformed into the sacred, but in a uniquely Mormon way. This “Celestial room” is of particular notice in our attempt to grasp the essence of Mormonism by way of looking at its architectural articulation of the sacred. On its surface, the room looks similar to what one might expect to see in the home of the most rich and famous of the world. Here, wealth glorifies God. This is not to say Mormons embrace the prosperity gospel that equates righteousness with worldly wealth, but it certainly makes the connection that heaven resembles that wealth. This is not the wealth to be gained by earthly economic fortune, but rather the belonging to the right heavenly community here on earth. Like Muslims on the Hajj, those who enter the temple once it’s dedicated put on new and simple clothes that make it hard to distinguish high class from low, rich from poor, powerful from weak. As you look at this Celestial room, you notice that there are no pictures of Christ and no images of the Cross. There are no relics. There is nothing that would give it away as obviously religious or sacred. Instead, it is adorned by plants, expensive carpet, sofas, tables and chairs. It looks like a place to hang out if you were so fortunate. Mormons call their temples “God’s house.” Indeed, it is a home where the sacred is understood to dwell, and where some Mormons speculate upon the possibility of “bumping” into Jesus himself, opening windows of Mormon temple folklore. This is Mormon cosmology and theodicy. It is the definition of what Mormons are to be transformed into. There may be messiness, poverty and chaos in the world, but once you enter into God’s house, those concerns are to disappear, and the eternal lends new perspective. This is to Mormons the ideal and beauty of their religion. This family-centric ideal however is not easy for all Mormons, and I stumbled onto this in my visit as well. As I thought about the sacred within Mormonism and how family-centric it was, I recalled what was said by an older long-time-single lady that stood behind us in line. She had come already to this open house of the temple and was excited for it to be built so she could go more often without the long lines. She stated while in line that she struggled remaining part of the LDS church because she felt like a failure due to being single in a religion that prizes marriage and family above all else. She wondered how Mormonism applied to her. She still seemed bothered by it and had her struggles, but the temple and its sacred space seemed to provide comfort for the very anxiety it helped create. Scholars of religion have found that the sacred often dwells within contradictions and perplexities, and here Mormonism offered no exception. As I stood in between the mirrors with my family gazing into the Mormon sense of the sacred, it was hard not to think about how this woman felt as she stood by herself in the same spot. This entry was posted in Art, Culture and tagged architecture, beauty, temples by Konden Smith. Bookmark the permalink. I think this is an interesting way of looking at sacred spaces, but I do really think the image of wealth and comfort that is being presented here (at least in the Gilbert temple that you’ve shown us) is an American view. Different cultures represent wealth differently, especially with regards to carpeting and furniture choices and things like that. As a European, I don’t immediately see wealth, I see an environment that is foreign to me–I’m not grasping the narrative cues you’ve expounded on so my experience is likely to be different. That might be another disconnect for those expecting the wealth of a European cathedral and getting the wealth of an American tycoon instead. Are most temples decorated in the same style or is a little cultural adaptability allowed? the cultural adaptability is very small, though there is some, such as the Agave stain glass windows at the gilbert temple. Something that I could have said was that the American and European sense of wealth are different, but I kinda mixed it with power. The kingdom (Europe) verses the corporate (American). Mormon temples don’t transcend this American model of the sacred, even as it’s exported globally. It would be interesting to me to see how those in Europe, AFrica or Asia think about the Mormon temples in their countries. Does the sacred resonate with them, or does it look foreign (American)? growing up as a kid in Utah, Mormons would often seek to make their homes “temples on earth.” Those with more wealth can pattern their homes after the temple as much as possible (similar art, clean, expensive). The Mormon sense of beauty as seen in art is also very uniform and parochial. 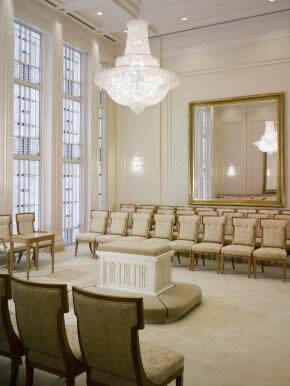 When I toured the Sacramento Temple, I was sort of astonished by the lack of color in the celestial room. To me, it seemed a somewhat dreary vision of heaven. I guess I always imagined heaven more as a variegated Edenic forest paradise than as “pure”-white architecture. Even the urban heaven (“New Jerusalem”) portrayed in Revelation is a colorful place, with golden streets and walls and gates adorned with different kinds of gemstones. Nineteenth-century ex-Mormon Anthony Metcalf had this to say of the celestial room: it was “the filthiest, commonest looking kind of a heaven that the carnal mind of man could imagine.” I think he was probably objecting to the use of wealth to symbolize divine glory, as you discussed in your post. It does, I think, send a somewhat mixed message in a Church that’s supposed to be spurning filthy lucre. By the way, Konden, these were really great reflections. Very well-written and insightful. Could this not equally be said of, e.g. St. Peter’s? Interesting thoughts. I’m a life-long Mormon, but unendowed, so I’ve spent far more time in the sacred spaces of other faiths than my own. When I toured the Gilbert Temple, I was not particularly taken with its beauty or its sacredness, which I had heard praised up and down for weeks before I finally went to see for myself. It seemed, as you say in your post, very corporate and ostentatiously expensive. It reminded me most strongly of a very fancy hotel lobby: clean, functional, and deliberately bland. Although cathedrals and other sacred spaces also conspicuously display wealth as a means of glorifying God, they somehow actually manage to convey a sense of holiness in their architecture. I don’t know enough about architecture to speak intelligently on the subject beyond my own impressions, but the effect of soaring vertical space is just different on my soul than the effect of carpeted hallways punctuated by end tables with identical lamps. It seemed like for all the money we’d poured into the lavish carpets and upholstery in the Gilbert Temple, all we’d succeeded in doing was making it, well, expensive. I think wealth in and of itself as a symbol of heaven just must not work for me. Clearly it does for others, but it just makes me feel like I shouldn’t sit down or touch anything. I think the arrangement of the seating in the Celestial Room–all facing the center–makes it hard to imagine having an individual spiritual experience in that space. There’s just something about sitting in an empty pew before an altar that makes me feel like I’m alone with the divine, even if there are other people in other pews. This has also got me to wondering if the early temples, such as St. George, Manti, Logan, and Salt Lake, have a similar vibe about them. Do they retain much if any of their historical character on the inside? Or have they been remodeled in the likeness of the world’s most formal sitting room? I have always enjoyed the inside of the early tabernacles in Utah. They’re not nearly as expensive or fancy as these new temples, but they do feel like sacred space to me. I would be just plain churlish, however, if I didn’t admit that the stained glass in the Gilbert Temple was gorgeous. Now stained glass, that’s an architectural technique that works on me! And the outsides of temples are quite lovely. Sorry for the long comment. I’ve been thinking about this a lot these past few weeks. The very earliest Mormon temples (Kirtland, Nauvoo, St. George) were configured very much like tabernacles except that they contained two meeting halls–one on top of the other–instead of one, like the tabernacles. It wasn’t until the Manti/Logan temples were built that the room layout was specifically configured for the endowment liturgy (and this was heavily influenced by the pattern set in the Endowment House, which was built on Temple Square in the 1850s). The interior decorative styles of Manti, Logan, and Salt Lake do seem to have followed the decorative model of an ornate Victorian parlor or sitting room. Logan was completely gutted as part of a renovation in the late 70s/early 80s (apparently there were some structural issues, and there had been a couple of minor fires), and it was redone in a very 1970s manner. St. George was also substantially reconfigured and one of its assembly halls eliminated to allow for ordinance work–this happened in the early 1900s, I think. Manti’s Celestial/Terrestrial/sealing rooms and adjoining corridors seem to retain most of their pioneer-era decor, as does Salt Lake (except that some originally stained woodwork has been painted over; and some period paintings have been replaced by more modern ones). 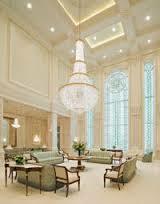 That was my first look inside a Mormon Temple. So very different than my Lutheran church.